When it comes to the ultimate man caves of the rich and famous, Jay Lenos garage is legendary. Jay’s known for two things – his hilarious comedy, and his deep passion for anything that has to do with cars. As an avid car collector, Jay Leno’s garage features luxury cars from almost every era, as well as some iconic cars that he just happened to buy for kicks. Everything that you could imagine that is related to the field of cars can probably be found in Jay Leno’s garage. Jay Leno’s garage isn’t a museum, even though the sheer number of cars inside of it rivals top auto museums in many corners of the world. The cars themselves run the gamut from the historic to the brand spanking new. 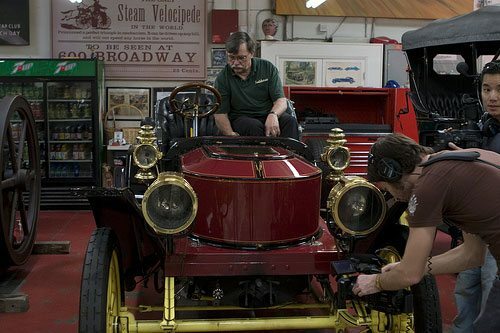 If you want to check out some of the more historic cars in Jay Leno’s garage, some of the cars of note include a Stanley Steemer (a 19th century car that runs on STEAM, not gas), and a 1906 Baker electric car. As far as personal history goes, the 1955 Buick that resides in his garage might just be the most important car in the lot. Why? It was Jay’s first car. Modern additions to his garage would make any automobile enthusiast drool, then turn green with envy. One of the most remarkable cars is his new 2011 Bugatti L’Or Blanc, which has sleek, one of a kind lines that make it one of the most easily distinguishable luxury cars on the market. Jay Leno’s garage is also home to a couple of high end motorcycles as well. One of his favorites is his Ducati 900 Super Sport TT. Here’s a great video about Jay’s Garage. Considering that there are over 100 different cars and a boat-load of motorcycles in Jay Leno’s garage, it’s easy to see why the comedian has to hire a team of mechanics to maintain all of his rides. Three expert mechanics, some of which have racing experience, are almost always seen tinkering with one of the many exotic autos in Leno’s garage. Sometimes it’s maintenance work, other times it’s hot rodding a favorite car. For the mechanics that Leno employs, Jay Leno’s garage is a home away from home. It’s hard to find a garage that has more cars inside, and even harder to find one where all the cars are intact. Jay Leno still drives all of the cars that he owns, and often makes an effort to appear at local car shows with some of his favorite models. Overall, this is one of the cool garages that Hollywood talks about. You can argue a lot of things about Leno’s sense of humor, chin size, or general strangeness, but one thing is for sure – this guy’s garage is the holy grail of car collections. The fun doesn’t stop inside the garage’s walls. Jay Leno’s garage has its own website devoted to information about the garage itself, along with information about the cars that currently reside in it. How many people can honestly say that their garage has a facebook fanbase of over 130,000 people and half a million Youtube subscribers? We’re guessing only Jay Leno. My New Dream Car in Jay’s Garage – a Jaugar F Type!